Different events call for different kinds of photo booths. No matter what kind of event you’re putting on, a huge corporate event, or a small birthday party, we have several photo booth styles to perfectly complement your event. Based on the classic photo booth style we all know and love, the enclosed photo booth offers a more private environment to let loose. This booth is perfect for all types of events. Bigger events call for bigger booths. Our open-air booths are perfect for large groups. Upgrade it with a green screen to add even more to the experience. With a minimal footprint and easy setup, the open-air photo booth is perfect for corporate events, conventions & expos, or pop-up events. 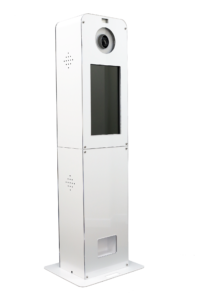 Perfect for parties that don’t have enough room for a larger photo booth, the digital photo booth can be set up anywhere, either on a wall or on a stand. *Does not print out photos.